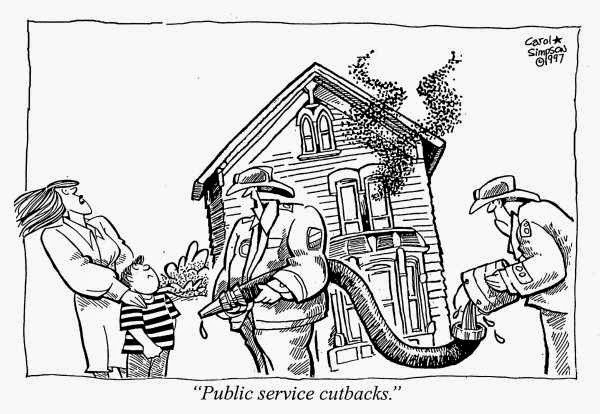 Fresh Economic Thinking: Why has the public service become impotent? Why has the public service become impotent? Sydney Morning Herald’s economics editor Ross Gittins recently wrote a scathing article about the quality of policy advice coming from the upper echelons of the public service. Treasury, and particularly Finance, copped a fair whack. While the article touches on some valid points and criticisms, I believe it misses some vital points as well. Far be it for me to leap to the defence of the public service, but I think Ross has been a little too indiscriminate in his criticism. There exists a disturbing lack of vibrant thinking in the policy formulation space in government in this country, and it seems that governments of all persuasions are only too willing to outsource policy development to various interest groups and (erroneously named) think tanks. These developments, as well as the seemingly unbridled growth in the number of staffers and advisors in ministers’ offices, has meant that the role of the departments in policy formulation and advice has been diminished. This may not necessarily be a bad thing, particularly if the onus of formulating policy shifts towards more expert sources, however I doubt this is the case, even allowing for any diminished expertise in the public service. Which brings me to the point of this post – why has the public service been effectively sidelined, or what has made it so impotent? The internal incentive structures of the public service are to blame for a large part of this and are dooming the public service to an existence on the sidelines of policy formulation. It remains true that there are some very capable, highly intelligent thinkers in the public service. However the nature of the beast is that the people who think outside the box, who come up with creative and radical reform options, are marginalised. Despite the plethora of ex senior public servants now running ‘training’ sessions about how to think creatively and influence people (whilst conveniently collecting exorbitant fees made available through previously cultivated networks), the public service culture prizes the ability to sit down, shut up and row in unison above all. Promotions in the public service do not go to those who propose the best policies to address a given issue, or show the greatest ability to think analytically about something, but rather to those who can convince the bloated HR departments of their ability to recite buzzwords, or attend the relevant afternoon teas. This results in the senior levels of the public service being filled by people who are very good at reading what people want to hear, and feeding that directly to them – whether that be the relevant minister or higher levels of their department. There is no way this will lead to optimal policy outcomes, even if the public service had the ear of ministers as it may have had back in the mythical “golden age” where government may have trusted public servants to be more than sycophantic rent-seekers. Frank and fearless advice be damned. This phenomenon has gone hand in hand with the rise of generalists in the public service. As best I can tell from statements about wanting people to be ‘all-rounders’ and ‘flexible’ there appears to be some kind of false premise that technical and deeper analysis skills are mutually exclusive from communication and organisation skills. This perverse scenario results in people in high places in large government departments who are little better than innumerate, but presumably can cook a great sponge cake. Incentives once at the very top of departments are no better. Departmental secretaries still tailor their responses to issues in such a manner as to present ministers with what they want to hear. Most policy advice is coming from a public service severely lacking in fearlessness, or ministerial staffers who are largely sourced from fresh-out-of-uni Young zealots, who are possibly even more likely to be telling ministers what they think they want to hear. In response to Ross Gittins – yes, some blame is rightfully directed toward the public service. But isn’t it time we looked at the way it is managed, and what incentives exist? Where is the public pressure for a more trusted and fearless public service? Whilst economists inside the public service seem to have been increasingly marginalised, there is no reason those on the outside need to remain muzzled about it. I suspect that the same thing that makes the public service serve up guff to its political masters is what means it can't bat for its own interests. It rewards compliance over individuality. In Treasury when I was there, the employees were razor-sharp. The only time I felt intellectually inferior was at Treasury. But they were like ferraris in the garage. Very little big picture stuff was contemplated. The slightest hint of a whim from a minister drove policy-making that was second best, or worse. Who can fix this? Ministers like compliant departments. Secretaries are in some cases highly attuned to their ministers. I think a really strong Public Service Commission could shake it up, and the number one place to start would be by hiring in from the outside. An Industry Department EL2 should be able to be replaced by someone from PWC, Deloitte, Qantas, Merck or Woolworths, not just someone from DEEWR. The more fresh eyes fall on the festering customs of teh public service, the better. Some good comments and ideas there. Some fresh blood from outside is a good idea, but I'm not sure how you get them in and keep them. After all, the problem is that many of them have probably tried th public service and left in frustration!